Leo (third left) greeting alumni members upon his arrival at the dinner gathering. 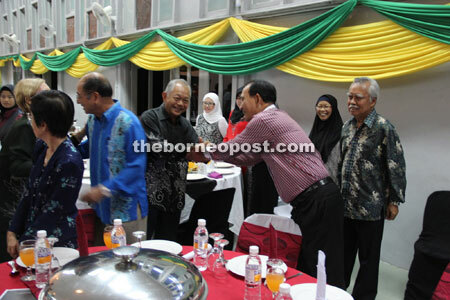 KUCHING: The alumni of Batu Lintang Teachers’ Training College (IPGBL) have a renewed role to play in guiding the new generation towards excellence, says Tenaga Nasional Berhad (TNB) chairman Tan Sri Dr Leo Moggie. Leo, who was the guest of honour at the IPGBL alumni dinner gathering at Brooke Hall on Friday night said, “We hope the alumni will continue to carry on the lively spirit of guiding the new generation and I trust it will be successful in its endeavour. Everyone of us has the right to be proud of IPGBL, which has a long and memorable history. Leo, who is also an alumni member, shared with those present the stories of IPGBL during his time. “Being the first teachers’ training school in Sarawak, students those days came from all over Sarawak, Brunei and Sabah. Lecturers were very dedicated in their job. It was a very memorable time for all of us,” he reminisced. Meanwhile, alumni chairman Razali Yu said the dinner gathering was part of effort to raise fund for an LED board. “We are hoping to raise enough fund for an LED board, which will be placed outside the gate to inform the public on what is happening on campus. “We thank those who have donated and those who intend to donate. Hopefully we will realise this project by end of December,” he said. He added that the dinner gathering was also aimed at strengthening ties among former students, lecturers, staff and directors. “We will organise more activities that will promote the existence of IPGBL to the public,” he said. Also present were Saribas assemblyman Mohd Razi Sitam, IPGBL director Awang Hambali Awang Hamdan and others.